Today I'd like to welcome Kate Sorenson of CouponCravings who is here to share some money saving tips and tricks to help organize your sewing room, on a budget. Quilting can be an expensive hobby. Sites like CouponCravings.com provide money-saving coupons and advice to help you cut costs on even the priciest pastime. With yards of fabric, thread, and sewing tools to purchase, there always seems to be something more that you need to buy. What’s more, all of these supplies have to be stored somewhere. It’s not uncommon for quilters to find themselves with a mess in their quilting space that makes it difficult to do what they love: quilt. So how can you organize your mess without spending a lot of money on expensive organizing tools? Here are a few tips that are also easy on your wallet. · Use prescription bottles to organize your smaller quilting supplies. 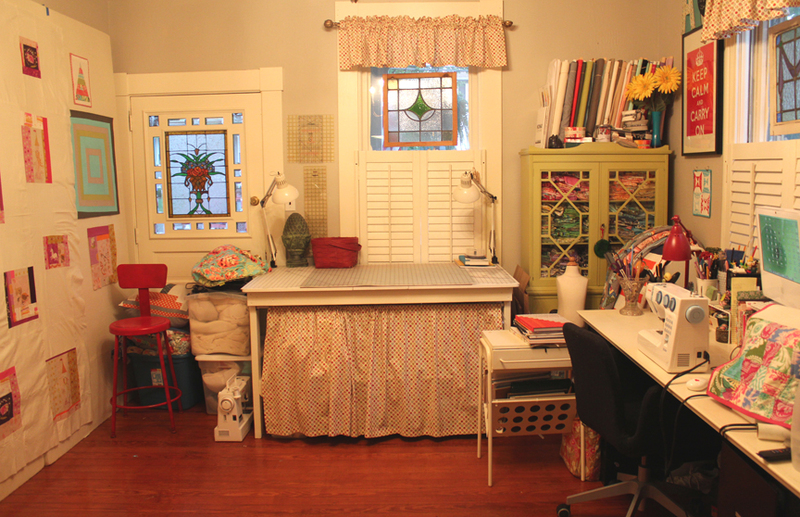 About.com asked their readers to share what their favorite tip was for organizing their quilting supplies. One reader’s response was for quilters to utilize old prescription medication bottles. Instead of just tossing them, use them to store things like bobbins, pins, and needles. You’ll save money you might have spent at the craft or container store on smaller storage systems. You can also keep a bottle dedicated to bent pins that you no longer can use. When it’s full, just throw it out. · Don’t buy expensive crafting furniture. HGTV.com explains that you can make use of an old desk you already have for a sewing table. Cut a hole in the top of the desk that you can lower your sewing machine into. Then, for a flat sewing surface, add a plastic template. Use a basic table for a cutting surface. If it is too short, you can raise the height by placing paint cans under the table legs. · Save your scraps for later use. According to MoonlightQuilters.com, you should make use of as many of your scraps as possible. Chances are you may have spent nine dollars or more per yard of fabric. If you throw away your scraps once you’ve cut out your quilting squares, you’re throwing money away. But you don’t want to just have piles of scraps lying around the house. Keep a basket near your cutting table to put scraps into to keep your space clear. Then, when you are done cutting, transfer them to a covered, cardboard box to keep them contained until you are ready to deal with them. Some people may find that their quilting projects leave a mess behind them. But organizing this mess doesn’t have to take a chunk out of your monthly budget. Just make use of what you already have on hand and you can clear the clutter, leaving a nice, clean space for your next project. Thank you, Kate! For more money saving tips, please visit Kate at CouponCravings.com. Love the tip on using prescription bottles! I have to disagree with the furniture thing. If I had a saw and a workshop (which I don't) then maybe I could cut a hole in a desk. But I live in an apartment and don't have power tools lying around. The new sewing cabinet I got actually has a lift, which allows me to put the top on, lower the machine, and close the door. Makes my small apartment actually work for me. It was certainly worth every penny for me. If you already have power tools and have more space, then yes, definitely just cut a hole in a desk. thanks for sharing. I really never thought of my scraps that way. I have been throwing a lot away but I will not anymore. rx bottles are a bad idea. Then you have a zillion little bottles of little stuff.... if it fits in there and if not? Better to go to the dollar store and get plastic containers that stack. Also, a great big help is investing in those storage carts with three and four and five drawers with wheels. Get a zillion of those for all of your supplies. You can make marvelous labels to tape on the front of the drawers. Every time there is a SALE of those at Target, get out there and treat yourself to another stuff holder. Also, big sterilite containers are great for holding large things like interfacings, stuffing, lots of large fabrics, you can sort and label those boxes too and stack them along the wall. I have my hoarding and filing down to a science here at the homestead! Crafters and sewists alike know that the see through boxes are what work. You have to see what you have.